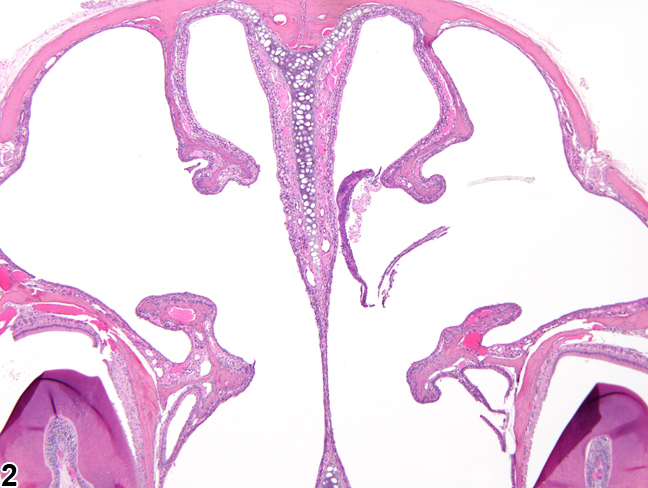 Nose, Turbinate - Normal in a male B6C3F1/N mouse from a subchronic study. Normal turbinates at level I are shown for comparison with Figure 2. 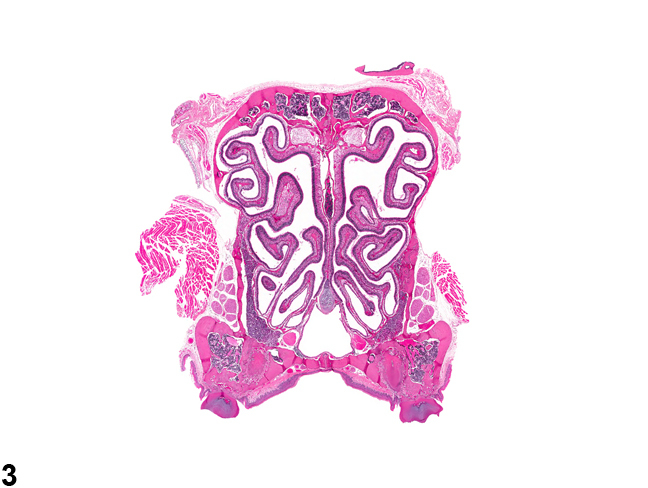 Nose, Turbinate - Atrophy in a male B6C3F1/N mouse from a subchronic study. The size of the turbinates is decreased compared with normal turbinates shown in Figure 1. 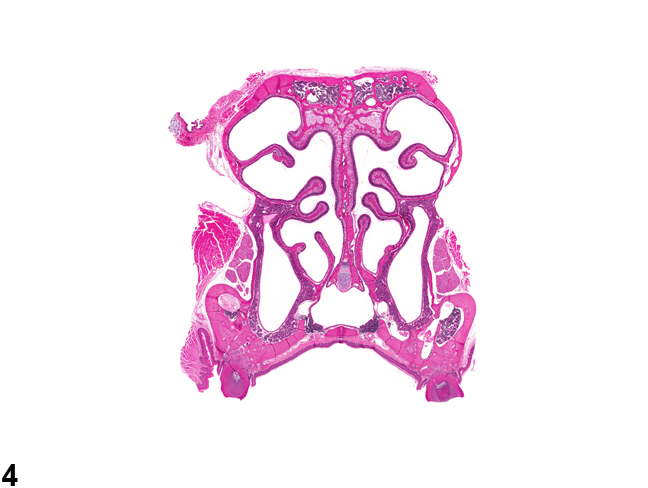 Nose, Turbinate - Normal in a male B6C3F1/N mouse from a subchronic study. Normal turbinates at level III are shown for comparison with Figure 4. 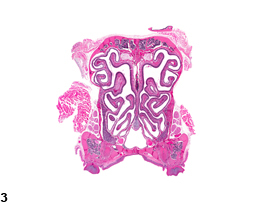 Nose, Turbinate - Atrophy in a male B6C3F1/N mouse from a chronic study. There is shortening and overall loss of turbinate area compared with normal turbinates shown in Figure 3. Atrophy of the turbinats ( Figure 2 and Figure 4 ; compare with controls shown in Figure 1 and Figure 3 ) can occur after exposure to highly irritating agents and is most commonly seen in chronic inhalation studies. It is typically accompanied or preceded by epithelial lesions, such as necrosis or inflammation. It may be accompanied by other bone lesions, such as hyperostosis (increased bone), necrosis of the turbinate bone, or perforation of the nasal septum. Inflammation and epithelial lesions may also be present. The pathogenesis of turbinate atrophy has not been elucidated, but it has been hypothesized that cytokines released by epithelial cells and/or inflammatory cells during chronic inflammation shift the balance between bone resorption and new bone production toward osteoclastic activity (and perhaps decreased osteoblastic activity, as well), resulting in a net loss of bone. 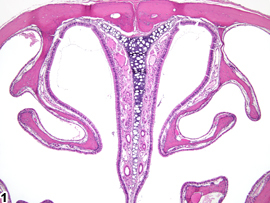 Males are reported to be more susceptible to atrophy of the turbinates than are females. Atrophy of the turbinates should be diagnosed whenever present and assigned a severity grade. Other lesions, including perforation of the nasal septum and hyperostosis, should be diagnosed separately when warranted by their prominence or severity. Boorman GA, Morgan KT, Uraih LC. 1990. Nose, larynx, and trachea. In: Pathology of the Fischer Rat: Reference and Atlas (Boorman GA, Eustis SL, Elwell MR, eds). Academic Press, San Diego, 315-337. Harkema JR, Catalano PJ, Hotchkiss JA. 1997. Consequences of Prolonged Inhalation of Ozone on F344/N Rats: Collaborative Studies. 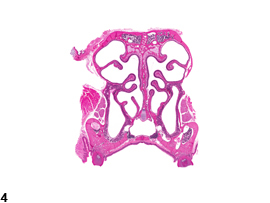 Part XII: Atrophy of Bone in Nasal Turbinates. Research Report No. 65. Health Effects Institute, Cambridge, MA. Monticello TM, Morgan KT, Uraih LC. 1990. Nonneoplastic nasal lesions in rats and mice. Environ Health Perspect 85:249-274.